Detectives are appealing for information after an armed robber made off with a sum of cash from a shop at Grand Street on Sunday evening. The man entered the shop at about 10pm and demanded money. He made off on foot with a sum off cash and is believed to have headed in the direction of Leamington Place and the towpath. The man is described as being approximately 5’11” tall, of medium build and in his mid 20s. He was wearing a grey jacket and grey scarf over his face. The clothing and knife used in the offence have not yet been located and it is possible they were discarded close to the towpath. Detective Constable Wallace said: “A 23 year old man was arrested on Sunday evening in connection with the incident but he has since been released on police bail pending further enquiries. 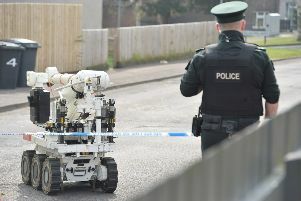 “I would ask anyone who knows anything about this incident to contact detectives in Lisburn on the non-emergency number 101.